BIBB / Two-year vocational education and training programmes in Switzerland – what potential for inclusion do they offer? Two-year vocational education and training programmes in Switzerland – what potential for inclusion do they offer? Switzerland pursues the educational policy goal that 95 per cent of all young people should acquire certification at upper-secondary level. The intention of introducing two-year vocational education and training programmes leading to a Federal VET certificate was to make it possible for disadvantaged young people to obtain an initial formal qualification which enables them to become integrated into the labour market and to enter continuing training. The present article describes these two-year VET programmes on the basis of general key indicators. It then undertakes a differentiated consideration of short-term and medium-term inclusion effects and reflects upon the potential for inclusion offered by this type of training. 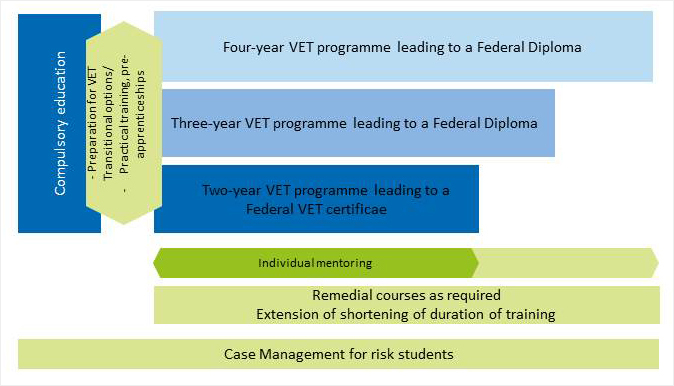 Two-year VET programmes leading to a Federal VET certificate were established within the Swiss vocational education and training system when the Federal Vocational and Professional Education and Training Act (VPETA) entered into force in 2004. Figure 1 shows formal training provision (blue) and optional support measures (green). Two-year VET programmes leading to a Federal VET certificate occupy the middle ground between the individual needs of lower ability young people and the requirements of the labour market. They aim to impart competences which lead to a standardised federally recognised qualification and enable learners to integrate into the labour market on a longer term basis. The Federal Council Dispatch to accompany the new VPETA of September 2000 (cf. Schweizerischer Bundesrat [FEDERAL COUNCIL] 2000) included the statement that the increased requirements made of apprenticeships must not be permitted to result in the exclusion from formalised training of lower ability young people. Although this new type of training should facilitate differentiation by individual abilities or needs, it should also take clearly defined skills requirements as its starting point (in contrast to the predecessor model of non-formal two-year apprenticeships). In order to achieve the qualifications required, young people with learning difficulties have access to the usual support or remedial courses at vocational schools and also have the statutory right to support in the form of specialist individual mentoring (pursuant to Article 18 VPETA). 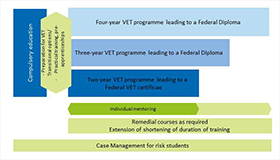 In order to realise the basic principle of “no qualification without connectivity”, the aim is for two-year VET programmes leading to a Federal VET certificate to facilitate progression to three or four-year training occupations for the purpose of acquiring a Federal VET diploma and thus secure access to professional education and training (cf. Figure 1). Two-year VET programmes leading to a Federal VET certificate are associated with inclusive objectives, whereby it is open which target groups with which disadvantages are addressed via this type of training. The guide on two-year VET mainly speaks of “young people of a mainly practical disposition” (STATE SECRETARIAT FOR EDUCATION, RESEARCH AND INNOVATION, SERI, 2014, p. 4). Within the context of national research and evaluation projects, there is also mention of “lower ability young people” (KAMMERMANN/HÄTTICH 2010, p. 11; STERN et al. 2010, p. 11). For young people with a disability, who have the right to disability insurance support for their initial training, a range of practically oriented VET training in sheltered institutions are provided.3 There are endeavours to establish connectivity of these training options with two-year VET programmes leading to a Federal VET certificate. In accordance with the UNESCO definition of inclusion (cf. DEUTSCHE UNESCO KOMMISSION [GERMAN UNESCO COMMISSION] 2009), two-year VET programmes leading to a Federal VET certificate are undertaken by persons with disadvantages on the basis of social, cultural or school origin. In 2013, the official training statistics for two-year VET programmes leading to a Federal VET certificate show a higher per centage proportion of young people from a migrant background than for VET programmes leading to a Federal Diploma (36,3 % as opposed to 16,1 %).4 With regard to the school origin of the first cohorts of participants in two-year VET programmes leading to a Federal VET certificate, who were from the retail sector and the hotel, restaurant and catering branch, we see that more than ten per cent previously attended classes for pupils with special needs and that 37 per cent had taken part in a transitional option prior to the commencement of their apprenticeship (cf. KAMMERMANN 2010). The question now arises as to which evaluation results with regard to the inclusive objectives are available ten years after introduction. Alongside regional and thematically restricted investigations, there are two investigations for the whole of Switzerland and (co-)financed by the Confederation. These are a cross-sectional evaluation of 29 training occupations in two-year VET programmes leading to a Federal VET certificate (cf. STERN et al. 2010) and a longitudinal study (the “VET certificate career study”) on the first four occupations covered by two-year VET programmes up to five years after completion of training (cf. KAMMERMANN/BALZER/HÄTTICH 2013; KAMMERMANN/STALDER/HÄTTICH 2011; KAMMERMANN/HÄTTICH 2010; KAMMERMANN 2010). The constant increase over ten years in training contracts for two-year VET programmes indicates the attractiveness of this type of training. A positive cost-benefit ratio also contributes to the acceptance in the companies of two-year VET programmes leading to a Federal VET certificate. The results of a study show that “the average productive benefit of learners during the period of training narrowly exceeds the training costs incurred by the companies. This net benefit is slightly below the value for three and four-year VET programmes leading to a Federal diploma identified in other studies. Around 55 per cent of companies have a positive net benefit.” (cf. FUHRER/SCHWERI 2010, p. 3). Notwithstanding this, there are considerable differences with regard to the average cost-benefit ratio between the various two-year VET programmes. Major regional differences can be observed in the dissemination of the two-year VET programmes leading to a Federal VET certificate. The rate of contracts concluded in French-speaking and Italian-speaking Switzerland has thus far been significantly lower than in the German-speaking part of the country. This may indicate a problem of acceptance in the former regions. The targets set have been achieved to the extent that the stakeholders involved largely believe that overall results have been positive. The evaluation shows that most representatives of professional organisations, cantonal authorities and VET trainers in host companies are either satisfied or quite satisfied with the implementation of the training. The level of satisfaction expressed by learners is even higher, something which is also confirmed by the VET certificate career study. STERN et al. (2010) further show that, although the pass rates for final examinations differ in occupationally specific terms, they are very high overall (95 % for all two-year VET programmes as opposed to 91 % for three or four-year VET programmes). Previously expressed fears that the increase in level of these training courses brought about by standardisation would tend to make it more difficult for disadvantaged young people to obtain a qualification beyond compulsory education have thus far neither been confirmed nor refuted. Relevant individual statistical data for the whole of Switzerland will not be available until 2015 onwards. It currently remains unclear whether two-year VET is accessible for young people in the lowest ability segment. Mentoring measures must be known to all participants and need to be easily accessible and rapidly available. Learning venues should cooperate and be supported by specially qualified agencies. Teaching staff at vocational schools charged with delivering mentoring measures should have a clear statement of specifications, time resources and an additional qualification and should also assume a certain networking function. A further evaluation conducted in the Canton of Zurich (cf. POOL MAAG 2011) confirms the important role of mentoring. It is revealed that mentoring increases the integrative effectiveness and sustainability of two-year VET programmes for young people with special educational needs. The following results from the VET certificate career study are used to respond to the question of the extent to which two-year VET programmes leading to a Federal VET certificate facilitate occupational inclusion (cf. box). * The study was funded by the Federal Office for Professional Education and Technology (OPET), the State Secretariat for Education, Research and Innovation (SERI), the University of Applied Sciences of Special Needs Education and the Swiss Federal Institute for Vocational Education and Training (SFIVET). It includes the following occupations: Retail assistants (two-year VET programmes), restaurant, kitchen and hotel employees (two-year VET programmes). Shortly before the end of training, the career prospects of two-year VET learners are revealed to be highly uncertain. Only 48 per cent have a secure connective solution (an assurance of work and/or a continuing apprenticeship). One year after completion of training, however, 88 per cent are in a secure occupational or training situation. Just over 60 per cent are in employment, mostly on a full-time basis. Workers who hold the Federal VET certificate are fairly mobile. Almost half of employees changed company after training. A quarter decided to progress to a three-year VET training programme. Comparative analyses (KAMMERMANN et al. 2011) with an occupationally specific partial sample from the youth longitudinal study “Transitions from education employment – TREE”5 show that, after two and a half years, those who have completed two-year VET achieve a comparable level of labour market integration as those who havecompleted three-year VET, whereby the former are more likely to have commenced further training one year after training than the latter. One thing which is difficult to explain is the precarious employment situation one year after completion of two-year training for young people who attended classes for pupils with special educational needs (special classes) during their period of compulsory education. Such young people are significantly less likely to be in employment or in continuing training than young workers from normal classes who have completed two-year VET and young workers who have completed three-year VET. 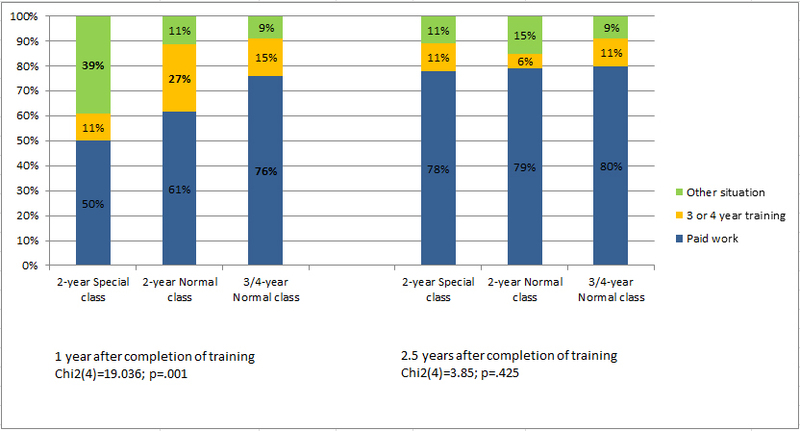 Nevertheless, this difference disappears two and a half years after completion of training (cf. Figure 2). For around two thirds of workers who have completed a two-year VET programme, their qualification forms the foundation for employment in the medium term. Five years after acquiring the Federal VET certificate, they are continuing to work in the occupation in which they have trained (cf. Figure 3). One in three persons has remained loyal to their host training company, whilst the others have changed company at least once during the intervening period. Around one fifth of respondents have chosen to work in a different occupational field. Eleven per cent are neither in employment nor in training, i.e. they are either unemployed (7 %) or mainly involved in looking after their family. 70 per cent of employees are working full-time and have a permanent contract of employment. For just over one third of those surveyed, two-year VET was the starting point for continuing vocational training. They have in the meantime obtained a Federal VET diploma or other continuing training qualification. More than 70 per cent are satisfied with their occupational situation and career. The majority are of the view that these correspond to their vocational and school abilities and their personal goals. In around one third of cases, initial analyses of the career histories of those who complete two-year VET show non-linear careers with longer phases of unemployment during the first five years after completion of training (cf. STALDER/KAMMERMANN submitted). Those who did not have any secure labour market or further training prospect shortly before the end of training seem to be in particular danger of progressing to such a non-linear career. Further analyses still need to be carried out to determine predictors for these at-risk careers. The question as to the inclusion potential of two-year VET programmes cannot be finally answered on the basis of the empirical findings currently available. In Switzerland, there is no valid empirical database to evaluate the situation at the first threshold, entry to training following compulsory education, for young people with learning difficulties or disadvantages. Notwithstanding this, initial findings from the VET certificate career study seem to show that young people who have managed to enter and successfully complete two-year VET have a realistic prospect of inclusion in the labour market, something which also encompasses the opportunity of continuing training. It is important within this process to be able to secure support measures and individual mentoring for learners with special needs during the course of training and in particular at the second threshold, the transition into labour market. In interpreting the results from the two-year VET career study, consideration needs to be accorded to the fact that they are solely based on two occupational fields. The extent to which the situation is comparable in other occupational fields remains an open question.